May 7 was a very good day for yours truly. Not only was it my birthday, but my new computer arrived AND I got free licorice to try. Woot! 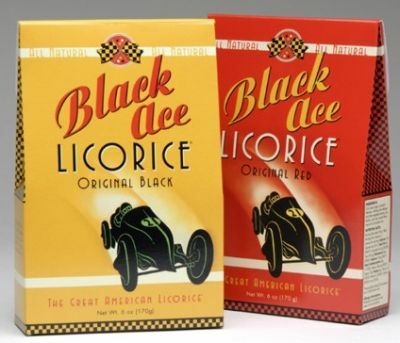 This time I got to try Black Ace Licorice, both red and black. I was immediately intrigued by the letter which accompanied the samples. It mentioned that, due to being wheat and gluten-free, a higher concentration of licorice root extract has to be used. More licorice?? Great! I was also pleased to have the chance to review a product safe for the growing element of our population who may have a wheat allergy; a close family member of mine has celiac disease, so the subject is close to heart. I started with the box of black licorice, excited to find out what a wheat-free licorice tastes like. I was initially taken with the extremely soft texture, which was softer than any other licorice candy I’ve ever tasted. After a while, however, I found that a significant portion of the candy got stuck in my teeth. Despite that, the texture still wasn’t bad, and the stuck bits came out fairly easily. The flavor was also very nice. Unlike some other licorice candies that have a significant portion of licorice root extract, these don’t leave a bad aftertaste or have too much bite. Indeed, I would say that the amount of licorice is very nice – neither too strong nor too weak. The red licorice proved to be just as tasty as the black. I’m not really sure what flavor it really is, other than “red.” Despite this, the flavor is very enjoyable. It isn’t too sweet at all, and has a slightly juicy, fruity flavor. In terms of texture, the red is almost identical to the black. Overall, I would say that this “All-American” candy is great for the average Candy Addict, but an even better find for those who can’t eat candy with wheat or gluten. If you know anyone with a wheat allergy, run out and get these to make their lives just a little bit sweeter! Black Ace licorice is available in Whole Foods, The Fresh Market, sometimes at Marshall’s and at most Specialty Food stores like Andronico’s, Dorothy Lane Market, etc. I’ve tried other types of black gluten free licorice and they have also had the stick to your teeth effect. Seems that the gluten in normal licorice binds everything together tightly. Never mind if you have celiac condition it is a small price to pay to get that sugar hit!